Ready, set, travel! Travelon helps to protect your information wherever you roam with this coordinated travel set. Both the wallet and passport case help keep hackers from lifting your personal information with RFID-blocking technology. Use the wallet as a clutch or wristlet and carry coins, cash, and cards with room left for your smartphone. Help keep your passport protected in its stylish case, and easily identify your luggage with the matching tags. Travel Set includes: wallet, passport case and two luggage tags, Wallet has lovely details including Nickel tone hardware, floral-print lining and quilting stitch pattern on exterior. 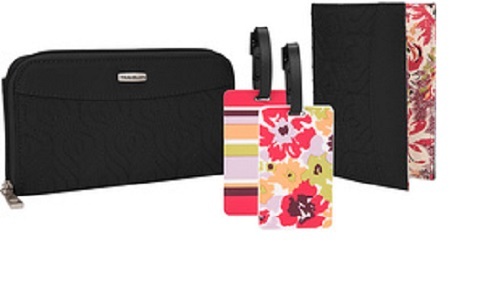 Wallet and passport case have RFID-blocking technology to protect information from unauthorized access, Luggage tags coordinate with the set, matching floral print and stripes.